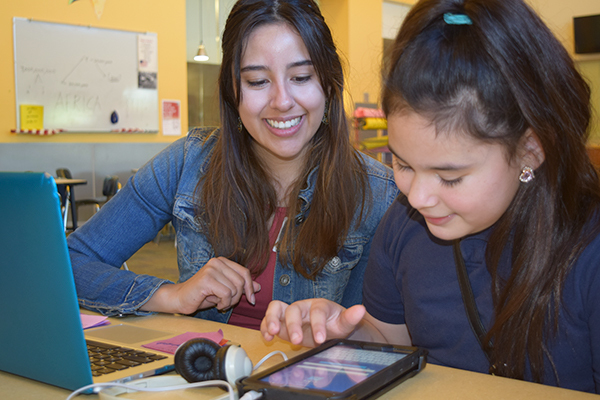 After struggling students at Woodmere Elementary increased reading proficiency by as much as 1.7 grade levels last school year, The Shadow Project was asked to pilot a Summer Reading Program, using an audio library that makes books come alive for children with learning challenges. The Shadow Project’s reading program combines an audio library specially designed for children with print and related disabilities, with one-on-one and small group reading support. Children made strong gains in reading proficiency, set and met reading goals, and began reading at home. “I’ve never seen anything like it,” said Beth Brod, M.S., Woodmere special education teacher. Shadow’s Summer Reading Challenge, hosted by the SUN Schools program at Woodmere, is intended to offset the “summer slide,” when children can lose as much as 25% of their reading skills. Eric, who will be in fourth grade next year, signed up for the challenge, even though he “doesn’t like reading much” because it is a lot of work. Eric didn’t read at all last summer. However, he enjoys the audiobooks and support provided by The Shadow Project and, because he likes chocolate, selected Charlie and the Chocolate Factory from amongst the 80,000 titles available. “I like to listen to the story and, with headphones, no one can distract you,” said Eric. Woodmere students who signed up for the challenge set a reading goal—Eric’s is to read 30 minutes a day, six times a week either at school or home—and then download books to read from a laptop, iPad, or phone. Each student’s progress is monitored daily.